Available from UK newsagents now, issue #5 includes an exclusive and extensive interview with Liverpool legend, Sir Roger Hunt. Roger remains the most profilic marksman in the league in Anfield history. - Guest contributions from The Times' football correspondent Oliver Kay and Red author Paul Tomkins. - Analysis and comment on all the latest at Liverpool: Hicks & Gillett's messy exit, the takeover of John Henry and NESV and Roy Hodgson's reign so far. - An interview with builder turned bard, Dave Kirby, who talks about, among other things, his new film, Reds & Blues: The Ballad of Dixie and Kenny. - Plus all your usual features and fan contributions that make up the biggest Red read out there. Latest magazine issue only £3, delivered directly to your door - Worldwide Delivery Available. WHSmiths, Easons and Martins & McColls are amongst the Well Red stockists. You can also ask your local newsagent to order you a copy if they don't already stock it. Supporters throughout the UK, Europe and Worldwide can order via the website. 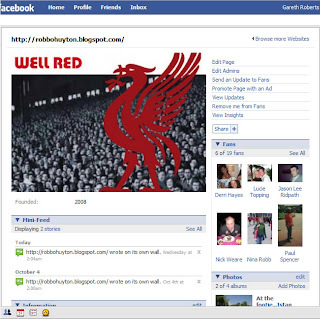 WELL RED MAG - INDEPENDENT MAGAZINE FOR LFC FANS WORLDWIDE. DON'T MISS IT! Take ONE minute to sign up to the Well Red newsletter. We respect your privacy. This Is Anfield: Sack Benitez?